Inflatable Kayaks. One and Two man with Kayak Paddles / Oars. Low profile for lakes and mild rivers! Responsive design, easy to paddle! Big, comfortable cockpit for easy entry and exit! Two spray decks with inflatable support beam! Inflatable I-Beam floor for comfort and rigidity! BRAND NEW INFLATABLE KAYAKS with "SUPER-TOUCH"(TM) is a high molecular PVC that is unaffected by gasoline, oil and salt water. It is highly resistant to damage from abrasion, impact and sunlight. It also permits more air pressure for rigidity. Kayaks/Boats do not have a warranty or guarantee for punctures/loss of air. MANUAL AND ELECTRIC (AC and DC) AIR PUMPS are available. 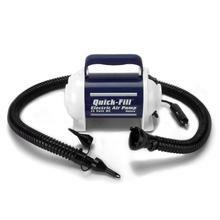 Quick Fill Air Pump - Works for both inflation and deflation Accordion hose has 3 nozzles sizes Plastic case with built-in carry handle. Choose from a 12-volt DC or 120V AC (wall) unit. 12-Volt DC Electric pump plugs into cigarette lighter and includes 9-ft. power cord. The 120V AC Electric pump plugs into a standard wall outlet. SUPER 120V AC Quick Fill pump pumps 95% more air than the standard pump.